When I saw this recipe on pinterest, I was like: must. have. now. But I also thought to myself that there must be a way to simplify the ingredients so that I wouldn't be in the kitchen all night with a sink full of dishes at the end. There are days I feel like doing that kind of cooking, and then mostly, there are days where I'd like things to come together quickly and easily. 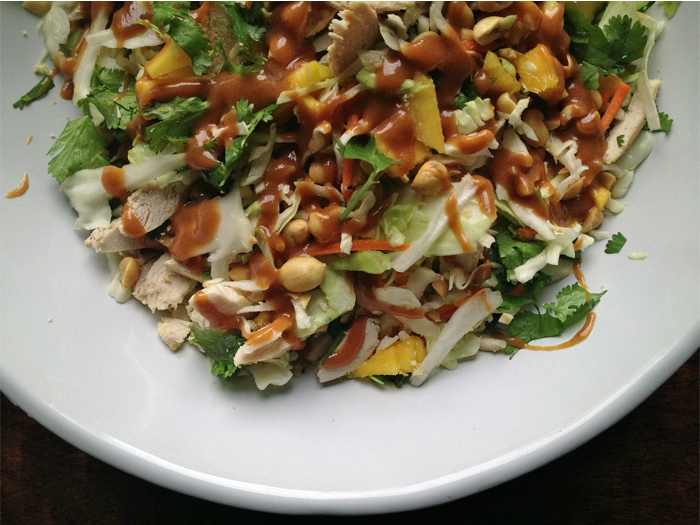 This salad is so easy, you'll want to make it every day. Seriously. It's hearty and delicious - the perfect dinner for two on a warm summer night. Start by prepping your chicken and putting it in the refrigerator to cool. Throw your cabbage and carrots into a salad bowl. Chop your mango into small bite size pieces - if you can't find a green one, just go for least ripe. You want it to be nice and tart. Slice your onions, including some of the green tops, and chop your cilantro. Add it all to your cabbage. Add in the cooled chicken and top with your chopped peanut. 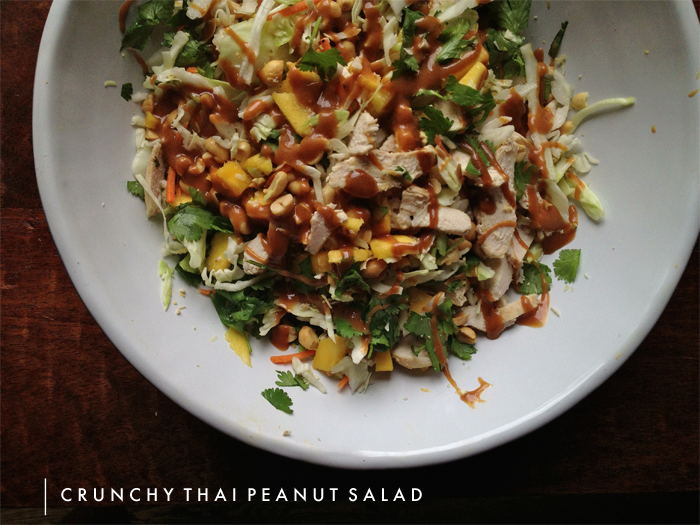 Drizzle with peanut sauce (which you can find in the Asian aisle at your grocery story) and toss just before serving. Prepare for delight and a tight squeeze from whoever you're sharing with, because they're going to love you just a little bit more than they do already. If there are any leftovers, store them in an airtight container in the fridge for up to one day. Enjoy! Oh yum! A woman after my heart! I had to laugh...you wrote "find it in the Asian aisle of your grocery STORY!" that's so cute...thinking of your girlie I guess?!! Education is not a business ,it is the power which help you to provide knowledge, if you teach any one or give knowledge to other then your knowledge will be increase. Find here best dissertation writing service for your help in study. Website is the premier method to introduce your business to the market. I find it good to see that you have done well in maintaining your site. Students not being able to write their academic coursework could opt for our Java Assignment Help and can get comprehensive homework written from us.